Seth narrowed his eyes as he looked at me. 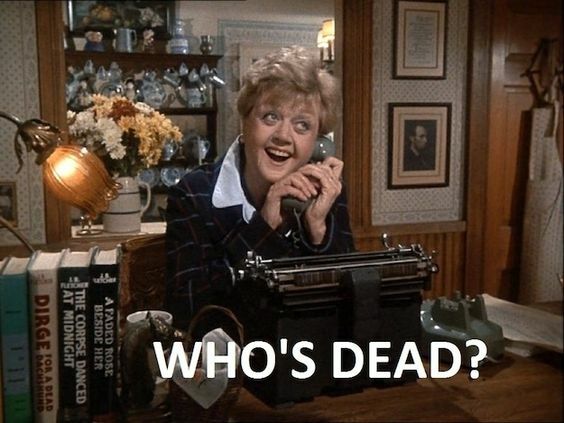 Murder, She Wrote was one of my favourite series. I still enjoy watching reruns of it. Of course, it was formulaic and you could guess the murderer within about 5 minutes, but that doesn’t matter. It was pure fun! When I found out a few weeks ago that there were tie-in books, there was only one thing for it – I had to find one. To my astonishment, there aren’t only many of them, but they are really popular! Except for one copy of Killer in the Kitchen, all of the copies at my library were waitlisted. Waitlisted! Anyway, getting to the book now…. I’m not going into the plot or the story. If you’ve seen one episode of the tv series, you can guess the plot. No. The interesting part for me was the writing. Would the tie-in portray the same characters, the same feel of the tv series? How would the writer(s) handle the fact that pretty much everyone who reads this already has some fixed ideas about the characters? Well, the short answer is by leaving out most of the description of anything. The writing almost entirely relies on the readers knowledge and pre-informed ideas of the characters and of Cabot Cove as a setting. I was amazed. Does it work? Yes, but only if you have seen the series. I doubt that the book, which almost entirely consists of dialogue between the characters would work for readers who have not seen the tv series. Also, because the story consists of mostly dialogue, interspersed with a little narration by J.B. Fletcher herself, it is sometimes difficult to make out the intentions of the character. Again, the book depends on the reader’s familiarity with the tv series. Killer in the Kitchen is actually one episode that I remember watching, so I am really not sure how the book would have worked on me if I hadn’t been able to picture the scenes. However, I have only read one book in this series, so cannot generalise about this. The question remains if I would read another one. In all honesty, probably not. I really prefer the series – because it thrives on the characters and the cast. The main mystery about Murder, She Wrote has always been why the inhabitants of Cabot Cove never moved. I mean, if I lived near J.B. Fletcher, I’d run for the hills. By the way, Val McDermid has been seen spotting the very same t-shirt. I simply cannot argue with Val. 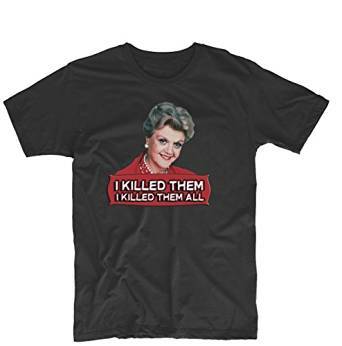 I was ridiculously fond of “Murder, She Wrote,” and still watch a re-run from time to time. I had no idea there were tie-in novels until I saw this. Thanks for sharing!